Hello all!! Today's theme for the 31 Day Challenge is Metallic! I knew today's theme would be perfect for two reasons. 2) Last night was my birthday party and these nails were perfect for it! The Very Colourfoil set is absolutely amazing and I totally recommend you buy it if you stumble upon it. I got it for $9.99 at Winners which was a great deal. Here's what the set looks like, ignore the Caviar one on top for now. I'll have to fit that into the challenge later. You get a lot of stuff in the kit, and if you're getting it cheap like I did, it's really worth it! 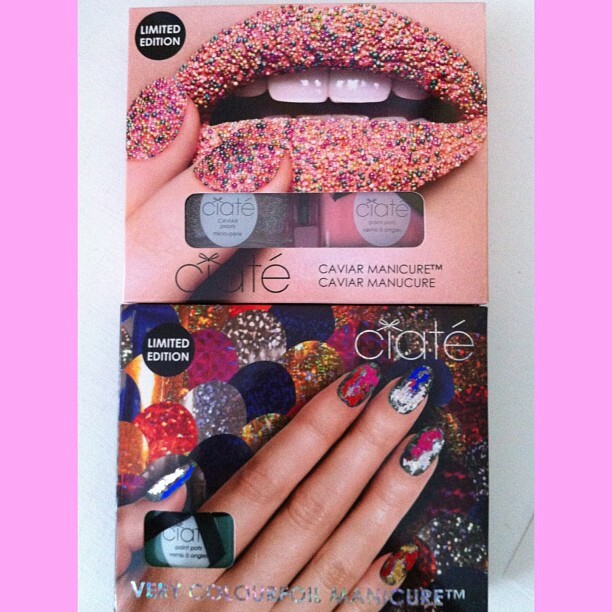 You get a full size Ciaté polish, a small bottle of Foil Fix glue which is necessary for foil manicures, a nail wheel to practice your technique, and of course the foil itself! You get 30 sheets which is really a ton. You use so little per manicure. It'll last forever! You get 6 different foils per kit. Considering a single Ciaté polish on its own costs more than that, why would you NOT buy this? I didn't wanna use the peppermint shade, I chose black to make the foils really pop for my party. And it turned out amazing! For those of you not familiar with nail foils, check out this video about the set. The most important thing to remember is as you are applying the foil, you apply with the design side UP. I didn't know that the first time I tried foils. Haha! I applied the glue in a random fashion to get several layers of different colors randomly around the nail. Another thing to consider is that most often, regular topcoat will ruin your foils. I'm not sure why, but I didn't want to chance it and decided to seal mine in with a gel topcoat. Now, that is usually against my personal nail rules, mixing polish with gel. There are lots of reasons why you're not supposed to do that which I won't bother preaching right now, but seeing as I only needed these to last one day, I don't care that I went against the laws of gel. The downside is that it sort of shrunk my black polish in some areas and I had instant tipwear. But it was only really visible in these photos. Still wearing my knuckle tattoos. Heh. The ring is from Urban Outfitters, BTW. I get asked that a lot when I wear it. So reflective!! So eye-catching! All my friends are demanding they get foil nails now. And I had so much fun with this kit that I don't even mind! I love this look! Beautiful! This is awesome! I love how colorful and metallic these nails are. I hope you had a fun birthday par-tay! Did you get any awesome polishes? Gorgeous mani, and happy birthday! I love it, looks amazing. I agree - it's lovely and I also love this look. Hope you had a very happy birthday! wooow that's amazing! it came out so pretty! I got this kit on clearance at TJ Maxx a few weeks ago and have been nervous to try it out. Now I'm excited after seeing how it turned out on you. Thanks!